Welcome to my blog! This week's Heart2Heart Challenges theme is "Get Your Kraft On" - Kraft Cardstock is a must for my crafting stash. I love the color and how it just makes any color or pattern look stunning. For this week's challenge I created this simple Hello card using the new Close To My Heart Flower Market Cricut Cartridge and a PML paper from the Swan Lake Patterned paper. 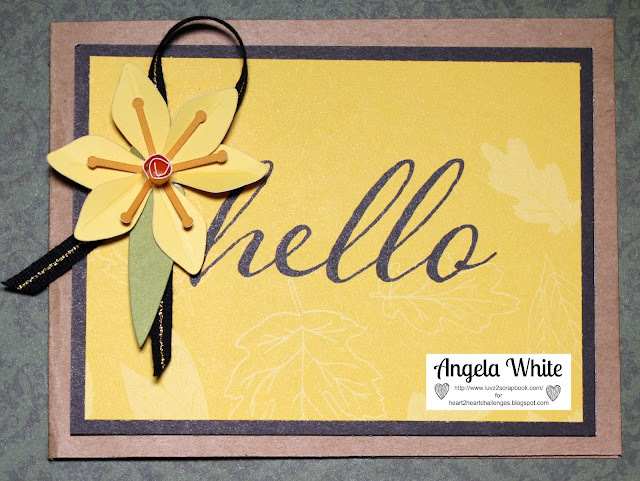 The Daffodil was created using a variety of Close To My Heart cardstocks and gives this card that pop of dimension. Thanks for visiting my blog! This project is featuring the October Luvz2stamp Club Card Kit video tutorial. If you are a member if the Luvz2stamp Club, you will receive pre-cut, pre-scored and pre-embossed materials to create 6 of these cards. I used the City Side Walks Patterned Paper and the Happiest Holidays M Size Stamp. The tree image was cut in Cricut Design Space and the Close To My Heart Art Philosophy Cartridge. Scissors, Tape Runner, 3D Foam Tape or Foam Squares, Ruby Ink Pad, Sponge Daubers. Adhere the City Side Walks Patterned Paper (Layer A) using a tape runner on the White Daisy Card base. 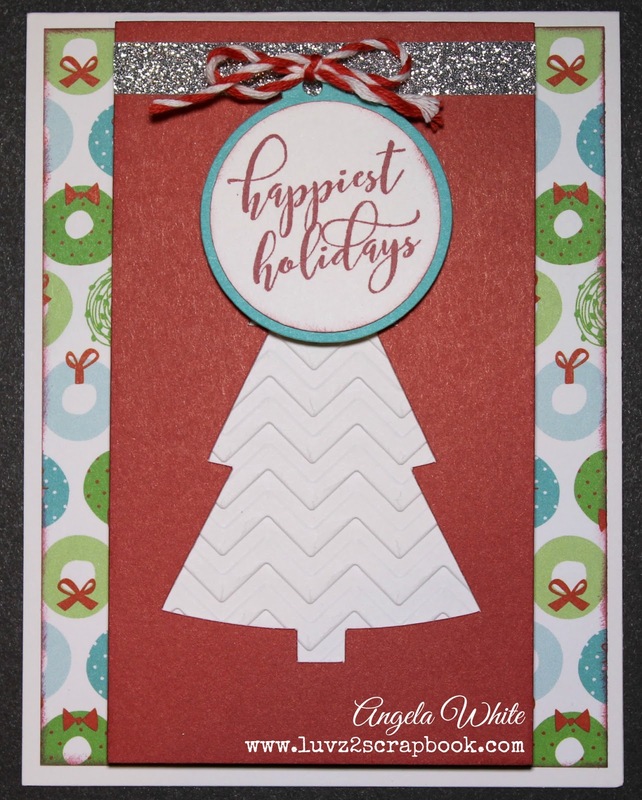 Adhere the Chevron embossed White Daisy Cardstock behind the die cut tree (Ruby Cardstock). Adhere the 3” Silver Glitter Tape ¼” from the top of the tree die cut. 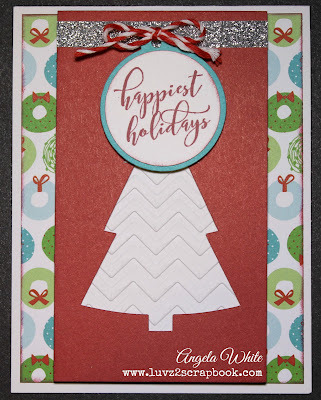 Using the Ruby ink pad (or similar color), stamp the “Happiest Holidays” sentiment on the center of the white daisy circle die cut. Use a tape runner to adhere to the center of the lagoon tag die cut. Add red & white baker’s twine to the tag and form a bow. Use 3-D foam tape to adhere the tag on top of the silver glitter tape. Adhere the completed Ruby tree die cut image on the center of layer A using 3-D Foam tape.